... for over 30 wonderful years! We want to help in these rough economic times. Over our years with the Spanek Roaster, one family after another has thanked us for bringing to market a product that not only delivers flavor and taste, but economically brings a delicious home cooked meal to the table, feeding a family of four for under $10.00. Can't beat that! A whole 3-4 lbs. chicken is about $5.00. It's the best value at the market! (Get used to buying whole chickens, not parts.) Get a box of rice or a few potatoes and some of your favorite fresh veggies. The grocery receipt will speak for itself. The prep time is a snap, and our recipes, tips, and on-line mini movies are all there to help you out. Our family has been cooking this way for over forty years and we consider our vertical customers our extended family. Help us reach out to those that you think would enjoy some economic strategy and flavor in their lives. You'll be a hero — to them and to us! Send them to our website www.spanek.com and tell them to click "Today's Special Value" — that's all there is to it! The kitchen is the heart of the home. Isn't it time to bring back American tradition and conversation to the table? Now more than ever? Great article about the Spanek Vertical Roaster — just click to read! The original Spanek Vertical Chicken Roaster, the Bon Appétit Poultry cookbook, and a slice of history — in a presentation package. Yours for just $69.95, while they last! Back in 1984, we got a telephone call from Bon Appétit Magazine. A chicken recipe by Lynne Kasper, at the time a Bon Appétit food writer (just a couple of years before she was named one of America's 12 best cooking teachers by the James Beard Foundation), had been judged the single best recipe over the last ten years of "best recipes" from the magazine in this category. "And we thought, since Lynne used your vertical roaster to create this fabulous recipe, maybe, Mr. Spanek, you'd be interested in creating a package of our cookbook and your roaster." That wasn't a hard decision at the time — we were honored! 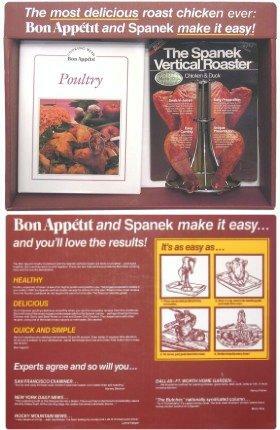 Well, the rest was well-made history: Lynne Kasper became a part of the Spanek Hall of Fame and a great friend, and the Bon Appétit people sold a lot of Spanek Roaster – Poultry Cookbook packages in bookstores. Never thought we'd see our vertical roaster sell in bookstores, but it did, and they sold tons. The other day we found just a few of these old original collections in a railroad boxcar we've been using for storage at our warehouse, and we thought we'd make them available as a special to any of our old friends who wish to get one, while supply lasts. So if you want a classic in time — the original Bon Appétit poultry cookbook from Knapp Press covering great chicken recipes from 1975-1985 (great little secrets there), not just vertical — enjoy and take advantage while they last. Bon Appétit everyone — enjoy! This is a special package and we hope you'll take advantage of the offer while the supply lasts. But there aren't many ... so go ahead and get one now! For more great Spanek Roaster values — click here! — All Sizes!